I keep forgetting to tell you about the series of historical fiction books I’ve been reading (thanks Jeanne, for telling me about them!) They are written by Gary McCarthy and all about National Parks, five in the series and they don’t need to be read in any particular order. I’ve read three so far and I liked Yosemite Thunder the best: http://amzn.to/1VtlXa0 They are all available to borrow free if you’re an Amazon Unlimited member, but if not, they’re not expensive, $2.99-$3.99 each. Oh remember those billions of flies I drove through awhile back? 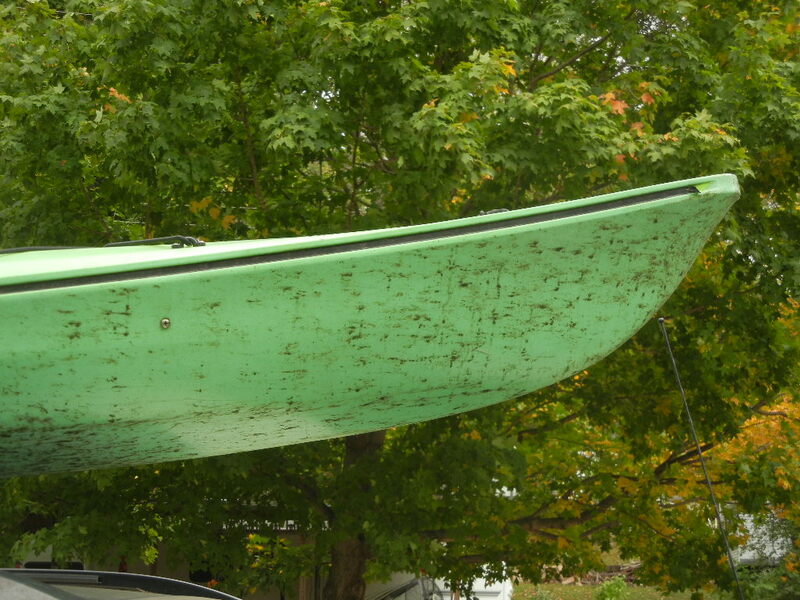 Well…..I didn’t notice this until several days later, but look what they did to my kayak! Ewwww! That’s what happens when you drive on dirt roads afterward…….. I have been “camped” at my friends’ house for the past week or so, but am moving to Curtis Creek Campground near Old Fort, NC on Sunday, for 14 days. With my Geezer Pass (Federal Senior Pass), it’s only $2.50 a night! I really did try to find free campsites the other day; I wanted to check them out while I was NOT dragging the camper along, and I’m very glad I did. I drove down some pretty awful roads and looked at about 15 campsites, and all but one of them were suitable only for tenters; there were only parking spaces large enough for one car, no space to get the camper/car combo off the road. Something that’s way different about the national forests in MI and NC is….mountains! Michigan is fairly flat, so there’s plenty of space to have nice big campsites. At least in the area I was looking at in Pisgah National Forest, there is just not enough level ground; the campsites are all hanging off the side of a mountain! Curtis Creek has 25 campsites but most are for tenters; only 9 RV/Trailer sites. It’s got vault toilets, drinking water, picnic tables, recycling and bear-proof trash containers! All for $2.50 a night! Well I admit the “bear-proof trash” is somewhat daunting, but there are bears even here at my friends’ house, so I guess I’d much rather be in an established campground with neighbors than be out in the middle of nowhere with bear visitors. I suspect I won’t get any cell or wifi signals out there. Oh, I just read that the campground is in the middle of a bear sanctuary! Gulp! This could be interesting! This entry was posted in Uncategorized and tagged Curtis Creek Campground, Old Fort, Pisgah National Forest, quincy's. Bookmark the permalink. Thanks for the heads up on the books Janis. Sounds like an interesting bear adventure ahead of you. No wifi, yikes. Janis unless you are outside waving a cheeseburger around I doubt that a bear will be interested in bothering you. And great news about your check. Ha ha, thanks BJ! I’ll try to remember that. Remember to make noise when you go out. Black bears are more afraid of you so I’m told. Making noise usually sends them packing. Food of course will lure them your way. There are some cool campsites along the road in the Joyce Kilmer forest. And if I’m not mistaken they are free. There is also a campground or two over there near Robbinsville. I wasn’t fond of the idea of getting my camper in most of the spots. But then I don’t back very well yet. So glad you finally got your check. I know that makes you feel good.